Amazon.com description: Product Description: In this book John Zaller develops a comprehensive theory to explain how people acquire political information from the mass media and convert it into political preferences. Using numerous specific examples, Zaller applies this theory in order to explain the dynamics of public opinion on a broad range of subjects, including both domestic and foreign policy, trust in government, racial equality, and presidential approval, as well as voting behavior in U.S. House, Senate and Presidential elections. Particularly perplexing characteristics of public opinion are also examined, such as the high degree of random fluctuations in political attitudes observed in opinion surveys and the changes in attitudes due to minor changes in the wording of survey questions. 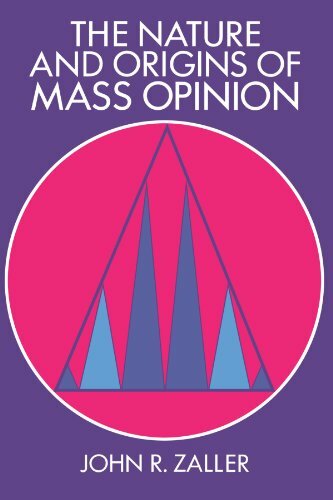 About: In this book John Zaller develops a comprehensive theory to explain how people acquire political information from the mass media and convert it into political preferences.